Season roast lightly with salt and pepper. In a large skillet, heat tablespoon of vegetable oil to high, sear roast on both sides. Place boneless chuck roast in slow cooker and use seasoning to season on all sides. Add beef broth to slow cooker. Cover and cook on low in slow cooker for 8-9 hours, or until meat is fork tender. 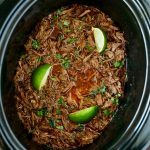 Once meat is tender, shred in slow cooker and serve with a squeeze of fresh lime juice and a sprinkle of cilantro.